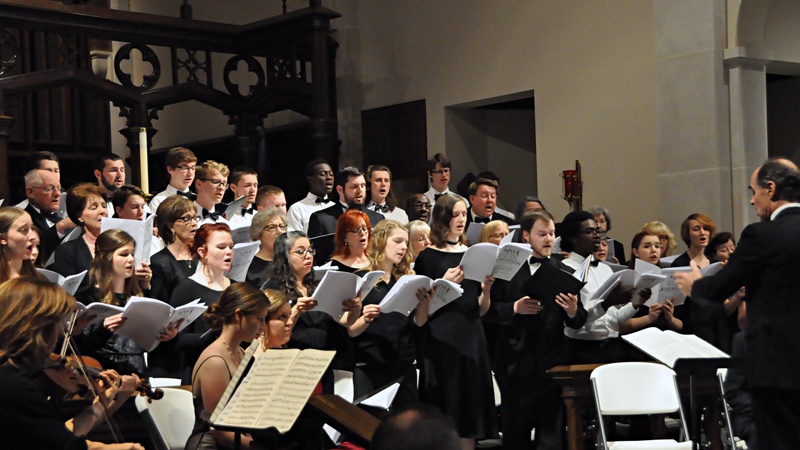 LeTourneau University choirs will perform “Songs of Love and Spring” at 7 p.m. Monday, April 1, at the Trinity Episcopal Church, 906 Padon. St. in Longview. The concert will feature the LeTourneau Singers, the 30-plus member student choir of LeTourneau University, and the 45-voice Longview Civic Chorus comprised of high school students through adults are directed by Dr. Jim Taylor, Associate Professor of Music and Director of Fine Arts at LETU. Admission is free of charge. One of the songs to be sung include the famous words of Elizabeth Barrett Browning, “How do I love thee? Let me count the ways.” The selection is set in a profound musical setting by contemporary composer, Eric Nelson. Other musical selections include the Kentucky mountain song, “Sourwood Mountain,” along with two of the Liebeslieder Waltzes by Johannes Brahms. “This concert gives each choir a wide array of musical styles to make it fun and interesting,” Taylor said. LETU’s annual Spring Masterworks Concert at 7:30 p.m. Monday, April 15 at the Belcher Center on the LeTourneau University campus will feature the two choirs joined by a full orchestra and soloists.